Imperial armor is composed of a variety of armor styles which are decorative versions of the common Legion veteran's heavy infantry armor. 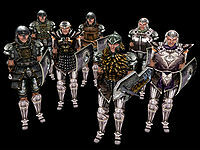 This type of armor is used mostly by the Imperial Legion. The most basic version of Imperial Armor is chain is worn over leather padding, with steel greaves, pauldron, cuirass, and helm. While other Cuirasses may be labeled as "Imperial", they will not be accepted as Uniforms in the game. Only two weapons exist in the "Imperial" style, though the Imperial Legion does not by any means restrict themselves to just these weapons. Of the two, the Imperial Broadsword is identical to the Steel Broadsword in appearance, though slightly inferior in terms of damage. Imperial Steel Armor: This heavy armor is the most commonly worn by Imperial Legion officers, and the only type for which a complete set exists. The cuirass may be used as a Legion uniform. Imperial Silver Armor: This heavy armor is superior to Imperial Steel in terms of protection, but it does not count as a Legion uniform. Duke's Guard Silver Armor: This heavy cuirass is worn only by the Duke's personal guards, though one can also be purchased. It can be used as a Legion uniform, and is second only to the Lord's Mail in terms of protection for Legion uniforms. Imperial Templar Armor: This rare armor is found worn by several members of the Legion, but the easiest way to acquire it is to perform quests for General Darius in Gnisis. It is superior to most of the other Imperial Armors in terms of protection (though it is surpassed by Dragonscale and some Chain parts, as well as the Lord's Mail, of course), and the cuirass may be used as a Legion uniform. Imperial Chain Armor: This is the most basic of the Imperial Armors. It is mostly medium weight, though the pauldrons are heavy, and there are no boots or gauntlets of this type, so you will have to use Imperial Steel. It is the only non-heavy armor which can be used as a Legion uniform. 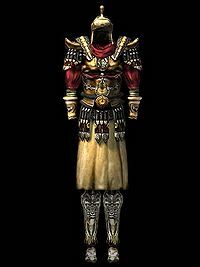 Imperial Dragonscale Armor: Only the helm, cuirass and shield exist for this medium armor. The cuirass does not count as a Legion uniform, though both pieces offer nearly double the protection of Imperial Chain armor. Imperial Newtscale Armor: This somewhat rare light cuirass is worn by a few in the legion, but it does not count as a Legion uniform. Imperial Studded Leather Armor: Another less-common light armor that is worn by some members of the Legion, but also does not count as a Legion uniform. * These four cuirasses are the only base cuirasses which count as Imperial Legion uniforms. Additionally, the Lord's Mail may be used. ** These pauldrons are heavy armor even though they are of the chain type. † The Imperial Steel Helmet also comes in a cursed variety. If you join the Imperial Legion, you will be issued Imperial Legion armor. In case you lose your armor, and need a replacement uniform cuirass to receive quest orders, the following is a list of all the locations where the two most common types of uniform cuirasses (Imperial Chain and Imperial Steel) can be found. Locations of Imperial Templar Knight Cuirasses and Duke's Guard Silver Cuirasses are provided below. In addition, the unique Lord's Mail qualifies as a uniform cuirass. This page was last modified on 19 October 2018, at 20:41.